Blogger Maksim Efimov. Photo provided to Open Information News Agency by Maksim Efimov. Maksim Efimov, head of the Karelia branch of the Youth Human Rights Group and author of the blog post ‘Karelia is tired of priests’, has asked the Department of Police and Border Protection of the Republic of Estonia for temporary political asylum. On 6 August Maksim Efimov told Agora Human Rights Association, which is representing him with regard to the criminal charges brought against him in Russia, that he was seeking temporary political asylum in Estonia. 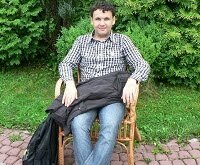 On 1 August Petrozavodsk town court dismissed a request by investigators to place Maksim Efimov in a psychiatric hospital to conduct an examination, a correspondent for Open Information News Agency reports. On 17 July investigator Aleksandr Voronin of the Muezersky district division of the Karelia Investigative Committee had personally withdrawn a similar request, but at the end of July again resubmitted it. On 28 June the Supreme Court of Karelia ruled the decision by Petrozavodsk town court on the request by investigator Aleksandr Voronin to place Maksim Efimov in a psychiatric hospital was unlawful. On 17 July the same investigator Aleksandr Voronin, acting in the name of the Investigative Committee for Karelia, withdrew the request. At the same time, the reason for issuing a federal arrest warrant for Maksim Efimov had allegedly been the refusal by the civic activist to be placed in a psychiatric hospital, a reason which no longer had any force. At the end of July it became known that the Investigative Committee had announced there was now an international warrant for the arrest of Maksim Efimov. Earlier, Russian psychiatrists and psychologists had publicly criticized the decision to place a healthy person in a psychiatric hospital, and called conclusion of the commission of experts of the Psychiatric Out-Patients’ Hospital of the Ministry of Health and Social Development of the Republic of Karelia, on the basis of which the investigator Aleksandr Voronin had initially sought to have Maksim Efimov placed in a psychiatric hospital, lacking in sound arguments, unfounded and unconvincing. These were the conclusions also reached by Professor Vladimir Mendelevich, a doctor of medical sciences and head of the faculty of medical and general psychology of Kazan State university, a practicing psychiatrist of 32 years’ experience with 14 years’ experience as a clinical psychologist; Vladimir Rubashny, the ex-head of the psychological service of the penitentiary system in Tatarstan, a psychologist with 18 years’ experience and a retired colonel of the Ministry of Internal Affairs; and Viktor Gursky, a doctor, psychiatrist, psychotherapist and narcotics expert at the Nizhny Novgorod Hospital No. 1 for Clinical Psychiatry, who has 28 years’ experience as a doctor and 19 years’ experience as a psychotherapist.